Sommet Education provides premium Swiss high education in hospitality industry. Education group is represented by international high schools Glion Institute of Higher Education and Les Roches Global Hospitality Education with campuses in Switzerland, UK, Spain and China. Sommet Education does marketing activities all over the world. There are students from more than 100 countries in Glion and Les Roches universities. My challenge is to adapt digital marketing strategy and attract potential students to schools from Russia, Ukraine and Kazakhstan. 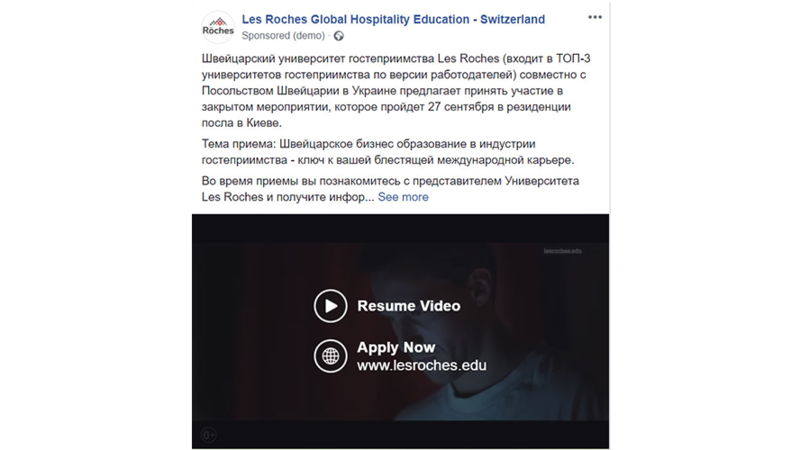 First of all we updated existing Russian Landing Pages of Glion and Les Roches universities, to bring there paid traffic from contextual and Facebook advertising. We run on a regular basis Facebook and Instagram targeting campaigns to attract potential students to company’s events in Moscow, Saint Petersburg, Kiev, Almaty and Astana. 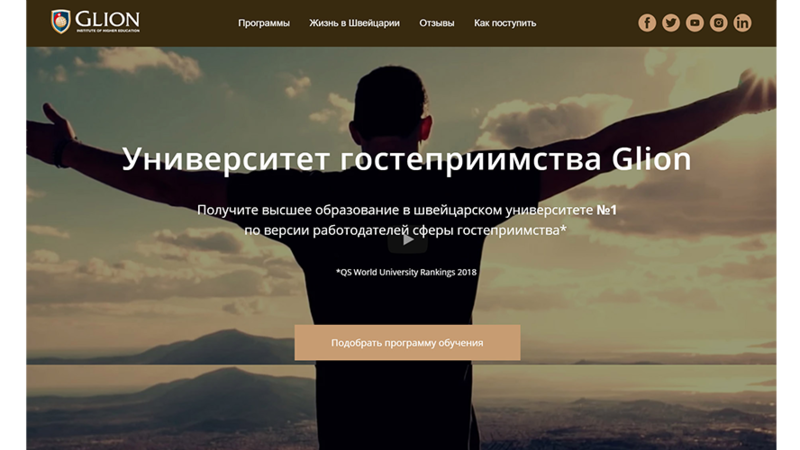 Main universities websites were translated into Russian according to SEO requirements in Russia. Also we launched video campaigns in YouTube and Yandex Video. For that, we translated video from English original to Russian language — voice, subtitles, text inside videos. 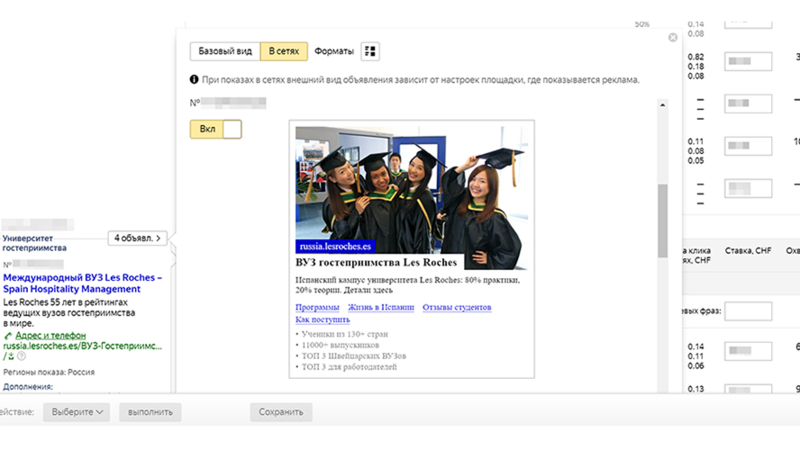 We do DMP — Yandex Display campaign for specific segments of audience. In the lead-up to events in Moscow, we published an interview with Glion’s alumnus on the thematic websites. After several months of intensive work we achieved great results. Cost Per Lead (CPL) from contextual advertising 4 times decreased in comparison with month of beginning of work. In August regarding to June reduction amounted about 50%. Conversion Rate (CR) of Landing Pages from Search PPC traffic is steadily increasing from month to month and in August compare with June, for example, we noted growth more than 2,5 times. Quantity of leads is also growing steadily. Facebook and Instagram campaigns «Lead Generation» have proven themselves as an effective instrument. Quality of that leads is worse than from Yandex Direct or Google AdWords campaigns, but due to quantity and low CPL this channel brings good result. More about Professional Digital Marketing support for your business in Russia read here.